Later: Thanks and congrats and see ya’ later! Happy Birthday! 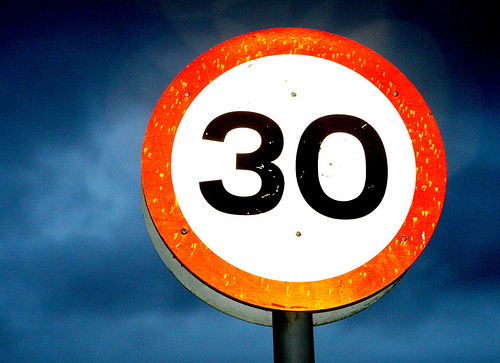 I turned 30 last year…a strange age indeed, somehow passing from young to old in one number. I, too, lost my slap bracelet, but luckily I can replace it with sill bandz. Happy Birthday! It is hard to believe that you are only just now 30. You’ve already done so much. And I have smartphone freakout syndrome too. I’m a technogeek, but have my phone ring and my brain shuts down immediately. Weird. What only 30? Not saying you look older, it’s just that I’m 64 and 30 looks pretty great from here. Happy birthday, youngin’. Happy Birthday to you! You’re an old soul, and that’s the only thing old about you. Wise beyond your years. Cheers to your next 30 years! As someone who has been 30 for all of 2 days now, it makes me sad that today’s kids don’t know who She-Ra is. Happy 30th! I turned 30 last week and realised that I was entering uncharted territory…I had never thought about what my life would be like post-30. I clearly remember as a child, thinking where I would be at the dawn of the new millennium, where I wanted my life to be throughout my 20’s; uni, a home, a husband, a baby???? But strangely enough I have never given my 30’s much of a thought until now. I like the idea of a new decade to embrace and explore – I just hope it contains slapbands (why oh why haven’t they had a comeback yet?). My thirties were my favorite decade, so far. Happy Birthday! I’m glad 30 doesn’t look too bad from where you’re standing – I’ve got just over 2 years to go, and it’s a terrifying prospect. p.s. I’m glad you know who She-Ra is. She and He-Man were my heroes when I was a kid. Happy Birthday! I turned thirty three weeks ago and reading your post made me realize that I am RELIEVED to have hit the point where I can lose my ability to operate electronics — guilt free! Happy birthday, Pasta Queen. Think of it as the first anniversary of your 29th birthday. Happy Birthday! i hope there’s cake and some sort of celebration involved. Here’s to 30 more! Happy birthday! I turned 30 earlier this year, and went through a period of retrospectively looking at my first 30 years. Ultimately, I am happy with where I am too. And the awesome thing about this future world? We can stream Voltron on Netflix and be back in the 80s … if only for a little bit. Happy Birthday! Speaking from the ripe old age of 32 I’m here to tell you the 30’s rock! Enjoy!! Hey, I took a math class once. (Once.) They explained to me that a 0 meant nothing. Therefore, I don’t think it counts. Happy Birthday! Loved this entry, made me laugh and smile :-) Have a great day! Wonderful post Jennette! 30 was such a milestone for me. I fretted about it for the whole year I was 29. Now I’m 41. I seriously gave less thought to 40 than I did to 30. Eh, it’s just a number. My 30’s were awesome and totally life-altering. I hope yours are awesome too! Happy Birthday! I’m getting ready to turn 41. Happy birthday! Don’t worry, no matter how old you get, you’ll always be younger than Seba (but still older than me, naaahaa!)!
. . . and this type of post is what reminds your readers of why you are the author of two books! Many more to come, we hope. I remember turning 30. I was in Bulgaria in a teaching job, and one of my students, trying to make me feel better (while I did not feel particularly bad), told me, “I remember when my mother turned 30, and you don’t look THAT bad!” And from that point on, I felt kind of bad about turning 30! Now I’m 43 . . . or 44 or something like that, and I look back at 30 and think how YOUNG that was! Your 30s are GREAT!!!! Enjoy them to their fullest. Happy birthday to you and happy birthday to me. I’ve been reading you for years and never knew we share a birthday. Today is my 36th rotation around the sun and I am glad I am not the only one feeling a bit introspective and wondering what else I am going to do in my life. First, cake! I hope you have a great day and celebrate the same way. Happy B-Day! As Laura I turned 36 today and I was actually remembering how weird I felt when I turned 30. I had the mid-life crisis like 10 years ahead of schedule. Happy Birthday! Wonderful post. I’ve made a lot of memories in my 30’s, some good, some bad. But all a part of sculpting who I am today, and I love her! Happy Birthday to you! I wish you many more. Have a great day! Happy Birthday dearie, to you, Laura, & Marie! I enjoyed reading this post. Was this one of the few bdays you didn’t see your Mum? TV shows such as Starsky & Hutch & Dukes of Hazzard were popular. There, now I hope I have succeeded in making you feel YOUNG again. haha. Or else you are wishing I was speaking English. Happy, happy Day to you. Happy Birthday, PQ. Awesome post! 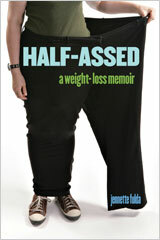 My b-day present to you is that I’ve been re-reading Half Assed and anxiously awaiting my chance to buy C&V. My daughter’s birthday is tomorrow and she will be 28. I can relate to your mom’s being electronically challenged. I also can remember my daughter’s slap bracelets and She-ra action figures. The years do fly by. As a 51 year old woman, I marvel at how far we have come. I do feel that there is still progress to be made. I hope you enjoy Jon Stewart and Stephen Colbert on Saturday. They are on the right track. I do wish I could be there. Happy Birthday! I love everything about this post. You really are an amazingly gifted writer. 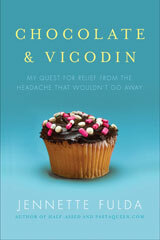 I pre-ordered Chocolate and Vicodin yesterday and can’t wait to finally get to read it soon! Happy Birthday!! Enjoy your day!! I turned 40 last year and I’ll tell you, wait til you get here…it’s AMAZING!! I have trouble with my smart phone, too. I’m usually acceptably proficient with things like this (for an old person–I’m in my 40s), but when I first got my new phone, I kept calling people by mistake by touching the screen slightly above the name I wanted. This included a hunky business contact whom I dialed, after hours, on two separate occasions. I apologized, but he probably thinks I’m some kind of stalker. Oh, I meant to say, Happy Birthday! Happy 30th from someone who’s had about a year and a half more practice at it. It’s not so bad. This however, made me sad – “thirty was the age where people stopped trying to change to world to suit themselves and started changing themselves to suit the world instead.” But I guess it’s kinda true. People start giving up their dreams and just becoming complacent. I think since I’ve been 30 I’ve been trying less to change the world, and started changing myself to who I really want to be instead of trying to be what other people want me to be or what’s easy/comes natural. So somewhere in the middle I guess. I put your new book on my wish list for Christmas. Congratulations on all of your accomplishments! Also, how are you adapting to life in NC now? I live in IL and would love to move somewhere warmer. Are you happy that you made the leap to a whole new state? when my son was little, he called birthdays “the day you change your number” well happy changing number day to you! I am looking at 60 next year, but feel pretty current with technology. The key is to work with college kids. Keeps one thinking young. But your comment about aging and feeling that most of one’s life is in the past, and not a whole lot left for the furture- got me thinking..hmmm. But I first got a card mocking my elderliness when I was 17. It was from my then 12-year-old brother. See, it’s all relative! Happy Belated 30th Birthday! Funny how I can think of someone who’s 30 as YOUNG! That’s what happens when you cross over to the 40s! I could still use someone to show me how to stop that blinking light on my VCR.